The Temple of Haein (‘sa’ means ‘temple’) is probably the most important Buddhist temple in all of Korea. It is located within the surprisingly scenic Gayansan National Park. While very famous among Koreans, it’s lack of international prestige is appalling, since it contains the Tripitaka Koreana. It is an amazing artifact, and uncharacteristic of Korean treasures by being original and not a rebuilt replica. It is a set of over 80,000 woodblocks that are the oldest known complete and flawless Buddhist Sutra, scriptures which serve as a guide to the Buddhist way of life. The only downside of this site is that photos of the Tripitaka Koreana itself are not allowed. One great, additional activity to do is a “temple stay,” where you practice the customs of monks for a full day. This temple is perfect to combine that experience with visiting this UNESCO world heritage site. One note I must make (for backpackers that travel with everything you own) is that Haeinsa is a good three km (1.6 miles) from the bus stop out of Daegu. This means you have to hike a good while uphill to even get into the temple, so be prepared to sweat a little. In my opinion, it adds to the feeling of accomplishment if you had to work for it.Haein Temple (Haeinsa) was constructed in 802 AD by followers of Korean Buddhism (Zen Buddhism). The land surrounding Haeinsa was awarded to the temple which has an additional 20 satellite temples (one of them pictured below). Currently the land is co-owned by Haeinsa and the Korean Government. In 1236, work began to make the Tripitaka to be copied and replicated for others to read. This ‘sutra‘ which is analogous to a Christian bible, was carved by hand in over eighty thousand wooden blocks, with over 50 million Chinese characters (hanja), as it predated the invention of the Korean alphabet (hangeul). Since it is the oldest known ‘sutra’ to be intact and flawless, it is essentially the oldest known version of the ‘Buddhist bible’ to again borrow the Christian comparison. Note: Due to the NO PHOTO policy, the two pictures showing the woodblocks are not my own, and are part of a postcard set given by the temple. I contemplated breaking the rules and sneaking a picture, but decided not to as a show of good manners. 1) Completeness and Originality (15/15): The woodblocks and the temple are both flawless and have never had serious damage. This is the standard for a perfect 15 score. 2) Extensiveness of the Site (7/15): The Tripitaka Koreana can be seen in about 30 minutes. 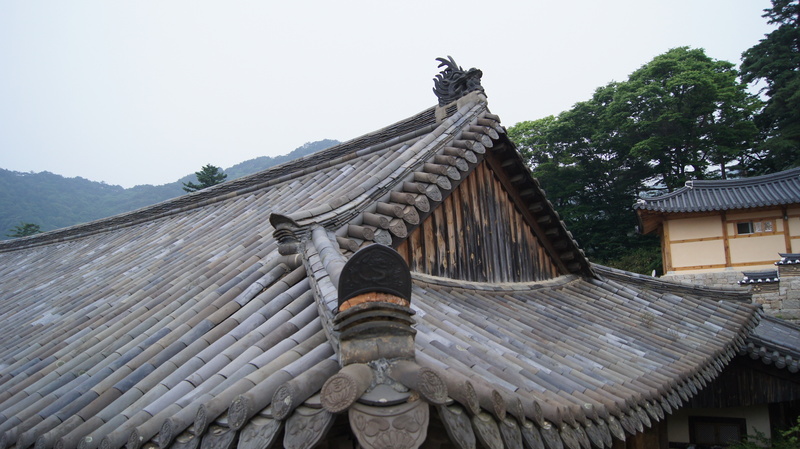 However, Haeinsa temple is one of the largest in Korea, with over a dozen satellite temples in Gayasan National Park. 3) Cultural Significance (12/25): Scholars of the era, and till this day, continue to use the Tripitaka as the authority of Zen Buddhism. This has influenced the religion of over 10 million people in Korea for 1200 years. The temple is also a leading authority and one of the three jewel temples of Korea. 4) Personal Impact (13/15): While I am a big fan of Korean Buddhist temples in general, this was definitely the best one. The setting on Mt. Gaya and the amazing Tripitaka Koreana in perfect condition made the trip worth while. 5) Logistics (6/10): Getting here was a little difficult to get to, even though I speak some Korean. From Seoul, it requires a train to Daegu, a bus to Gayasan, and a 2-3 km hike up the mountain. 6) Uniqueness (14/20): The temple is kind of like any other Korean temple. They are all very pretty, but hardly unique. The woodblocks of the Tripitaka Koreana are unlike anything I have ever seen.